Yesterday I went to my Crochet group meeting and one of the ladies in the group named Rachel made for me a crocheted baby hat and a baby poncho to go with the crocheted baby blanket I had made. I did not know how to make the baby hat or poncho so she said that she would make it for me so that I could have a set to sell at our church's annual Christmas Fair. When I saw how cute the set was I asked her if she would write out the pattern directions for me and she did. 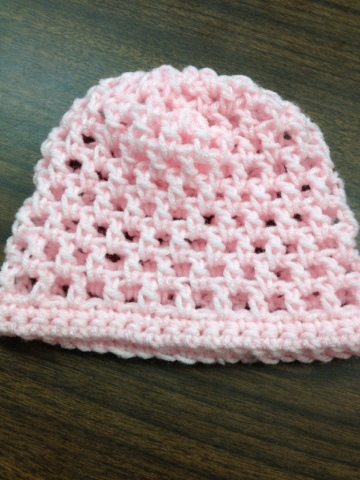 Then to my surprise she said that she would teach me to make the baby hat. I sat and crocheted the hat and it took me about a half hour to make. I think that it came out pretty good for the first time and she said that next week she will teach me to make the poncho and a little flower to attach to the hat. This is why I love going to my crochet meetings because we all work together and help each other out and keep each other motivated.